The Center for Development Research (ZEF) is an international and trans-disciplinary scientific research institute at the University of Bonn, Germany. The University of Bonn (founded in 1818) is a public research university with a total of 525 professors and 31,000 students, and is today one of the leading universities in Germany. The ZEF has three research departments: Political and Cultural Change; Economic and Technological Change; Ecology and Natural Resources Management. With its international doctoral program, ZEF aims to educate a new generation of academics as well as decision-makers for national and international policy and research organizations. Its international and interdisciplinary set-up as well as its size make this program unique in Germany and Europe. 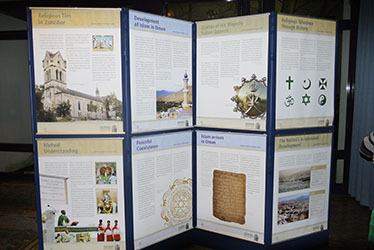 The exhibition "Religious Tolerance in Oman" was on display at ZEF from December 17, 2014 through January 15, 2015. 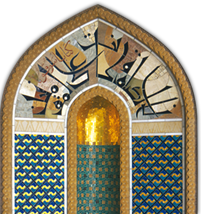 The opening took place at the "Alternative Wednesdays" event with the screening of the film titled "Religious Tolerance in Oman" on December 17, 2014. The event was attended by the head of the Omani diplomatic mission in Berlin, Mr. Hamood Al Rumhi, approximately 50 academics and scholars from ZEF, as well as members of the general public with an interest in Oman. 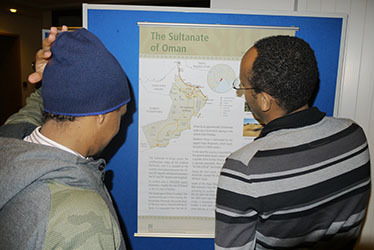 The event was well received by the viewers who, following the film screening, enjoyed Omani coffee and halwa and engaged in a lively discussion.